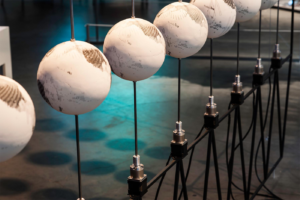 Nov 14, 2017 • This week at the Pecora 20 conference in Sioux Falls, South Dakota, Uncharted—Footnotes to the Atlas, a cartographic art installation, will be on display. Uncharted was conceived of and created by Studio Folder, a Milian-based design firm started by Marco Ferrari and Elisa Pasqual. Ferrari is an architect by training who has focused on modes of representation in his design work. Pasqual is a graphic designer with a background in both industrial design and communication design. The exhibit, which was originally shown at the 2016 Oslo Architecture Triennial, examines the infrastructure behind contemporary cartography. A portion of the exhibit tilted “Sensing,” features the historical acquisition patterns of the Landsat archive from 1972-2016. The annual global Landsat data acquisitions (prior to the USGS archive consolidation project) were drawn onto small plaster globes for each acquisition year to show the patterns of Landsat imagery collection. Through Thursday, November 18, Uncharted can be viewed in the exhibit hall of the Sioux Falls Convention Center where Peocra 20 is being held. Then it will move to its permanent home at the USGS Earth Resources Observation and Science (EROS) Center. How did you decide to focus on Landsat for the “Sensing” portion of your Uncharted exhibit? Landsat sits at the confluence of many, incredibly interesting issues. It’s the longest running program of Earth observation, thus allowing us to study the evolution of the technologies involved in it; it helped to shape and crystallize the idea of Earth as a shrinking and interconnected planet; its images were used to produce the first mosaic of the whole surface of the planet, showing in a comprehensive way how all natural processes are related, and how they are affected by human transformation. The aim of Uncharted is to read beyond the apparent evenness of this global image, and reveal the fragmentary nature of the satellite mosaic. Not secondarily, the possibility to download all Landsat data products for free and with no restrictions permitted us to start playing immediatey with the data, testing initial assumptions and prototyping visualizations that otherwise would have required permissions and negotiations with institutions. Why does the Landsat program inspire you? Many of the theoretical and technical issues we’re facing nowadays—from the problems around the ownership and sovereignty of data, to the independence of scientific research and the ways by which is funded—have been addressed for the first time by the Landsat scientists and engineers decades ago. Today there’s a lot of talking about the long-lasting impact of human transformation on the geological scale of Earth, and Landsat is one of the tools through which we were able to realize this for the first time. It’s one of the first embodiments of planetary-scale computation (another expression around which there’s a lots of hype today), and it’s also the global infrastructure par excellence, making it the perfect testbed to understand possible models for international cooperation. Did you create the drawing machine that was used to engrave the annual Landsat data coverage information onto the exhibit globes? 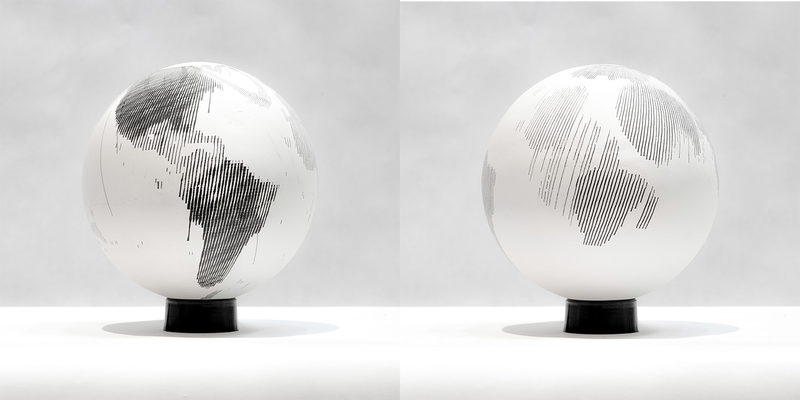 We initially wanted to design and build a custom machine that would serve to realize the 45 spheres of the Landsat exhibit—and potentially be part of the exhibition itself. Since the Landsat program is ongoing, we were keen to have a real time representation of the satellites activity in the exhibition itself, visualizing the pace at which new data are produced and acquired on a daily basis. Unfortunately, given the limited timeframe in which we developed the project, we realized that this would have been a too demanding component to build from scratch. 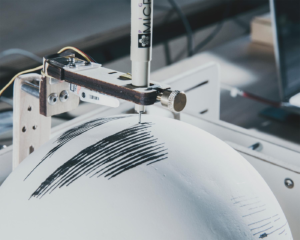 We then searched online and we found this amazing open source robot that fit quite nice for our purpose: we only had to hack some minor components to fit our spheres, and then we developed the code that allowed us to transfer the annual Landsat metadata onto the surface of the globes. To many people outside of the remote sensing community the data acquisition history of Landsat is rather esoteric. How do you see this collection history impacting society at large? We live in uncertain times, in which the role of public institutions in supporting scientific research and the “greater interest” of humanity is jeopardized by propaganda and nationalisms. The conservation and access to decades of data on climate change is endangered by the fast moving boundaries of what we consider a public heritage worth being protected. The Landsat archive is an invaluable example of a resource that is important not just for what it allwos us to do now, but because it constitutes an incredibly detailed image of the Earth’s past. Do you have plans for additional analysis and visualizations related to Uncharted? If so, can you share what they are and where they might be displayed? Uncharted is an ongoing project through which we want to continue to investigate different aspects of the history of remote sensing. We’re interested in understanding in detail the work that is being carried on for consolidation of the Landsat archive, visualizing how the global network of ground stations developed over times, and how each progressive technological innovation affected our way to look at the planet. On the other hand, we’re also looking at the present, and in particular at how innovations like AI, machine vision, open source standards and hardware, COTS, miniaturization and distributed networks are entering and disrupting this field. At the moment, we’re working on a next phase of the project as a joint collaboration with Kei Kreutler, a researcher and developer based in Berlin who has started OSO (Open Space Observatory), a pioneering research project that looks at the people and technologies that are making space more accessible. This entry is filed under Data, News, Q&A.